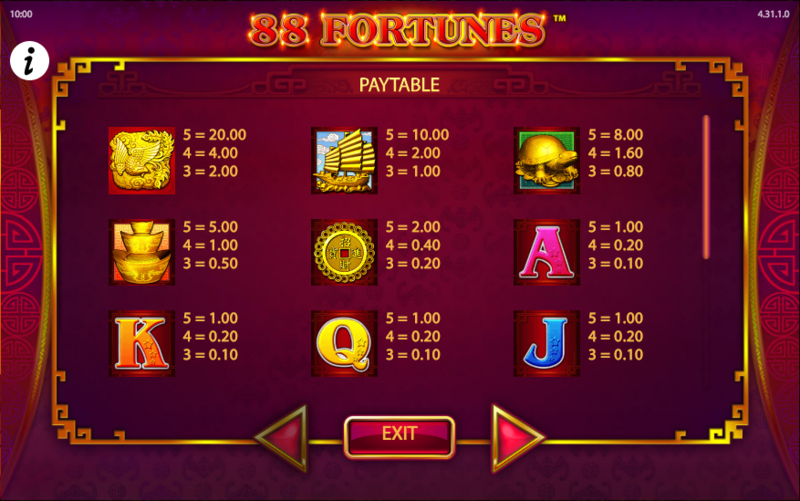 Veterans of online slot machines will be well aware that the number eight is lucky in Chinese culture; that point is hammered home here in this brand new game from Bally Technologies called 88 Fortunes. It’s a smooth and glitzy release with a free spins bonus feature and a tasty progressive jackpot. There are six theme-related symbol including the bird, the ship, the turtle, the pile of gold ingots and the Chinese dollar; lower values are the standard 9, 10, J, Q, K and A. Players can bet at five different levels and at each level one more of the themed symbols will be gold and worth more – you can see which symbols are actively gold in the upper left hand corner. The number of gold symbols played also determines which jackpots can be won. The wild symbol is the Fu Bat icon and it appears only on reels two, three and four, substituting for all others. The gong is the bonus symbol which activates the main feature. 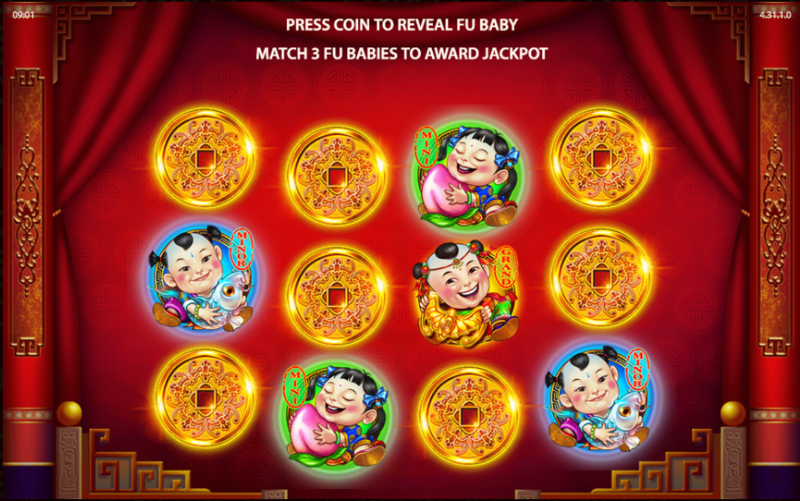 This is triggered by landing three or more of the gong bonus symbols starting from the left hand side; you will now receive ten free spins on a set of reels containing only the theme symbols. 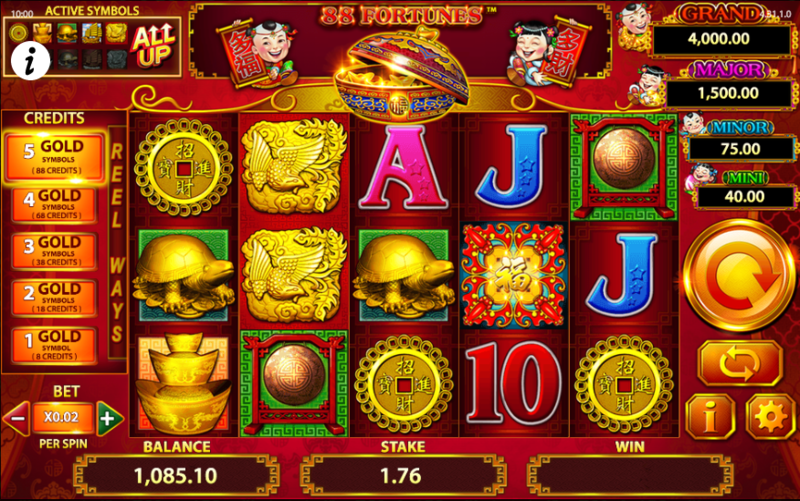 More free spins can be won by landing more gongs during this round. Each time a wild Fu Bat symbol lands on the reels there’s a chance that the jackpot game will be triggered. If you get lucky you’ll be taken to a screen like the one shown below and all you have to do is keep picking the coins until you find three matching ones – this will determine which of the jackpot prizes you win – Grand, Major, Minor or Mini. We like 88 Fortunes, it’s colourful, atmospheric and the bonus features seem relatively easy to trigger. If you want to play for the progressive jackpots, don’t forget to bet at the five gold symbols level. 88 Fortunes has an RTP of 95.93%.